Studio 56 Lofts at Town Center community is sold out and is not in active development by builder. If you are interested in Studio 56 Lofts at Town Center or similar new home communities, contact us today! Our agents are very familiar with new and newer construction in Virginia Beach, and can identify resale opportunities in Studio 56 Lofts at Town Center, as well as builder inventory available in nearby or similar communities in Virginia Beach. To view 3 more pictures, interactive maps and the full, detailed description of the Studio 56 Lofts at Town Center community, please Login. Real estate in Studio 56 is comprised of new construction lofts. Certainly not your father’s condo, each unit here is what contemporary city living is all about. The one level pads bring a piece of the Big Apple right here to Hampton Roads. Location is key as this building is smack dab in the middle of the Town Center of Virginia Beach. Military bases like NAS Oceana, Naval Station Norfolk and Joint Expeditionary Base Little Creek-Fort Story are within easy driving distance and many other places are even within walking distance. If the draw of a condo is a low-maintenance lifestyle, then this is just the right place. New construction real estate in this shape and style does not come along everyday in Virginia Beach, VA. Each home in Studio 56 may feature sliding glass door to faux French balcony, hardwood flooring, track lighting, large capacity washer and dryer, biometric entry system, Trane HVAC system, granite countertops, undermount sinks, stainless steel Frigidaire appliances, garbage disposal, Kohler faucets, ceramic tile flooring and more. These lofts start at just over 800 square feet giving ample living space for today’s mover and shaker. Real estate doesn’t have to just be an address, it can be a lifestyle. Studio 56 is all about helping homebuyers let loose and live a little. It’s not every new construction condo complex that has a rooftop deck. That’s right, in keeping with the big city theme, these lofts have a community rooftop deck. Enjoy a morning cup of coffee, meet those neighbors or watch the sunrise on this cool amenity. It’s not who you know, it’s where you go. Living in one of the most happening real estate developments in Virginia Beach means every day is an adventure. Catch a comedy show at Funny Bones, go downstairs for a world-class seafood dinner at McCormick’s and Schmick’s and indulge in a delectable dessert at the Cheesecake Factory. Like the big city but want the southern charm only Virginia can procure? Enjoy modern flair in an urban condo? Like being able to get just about anywhere without a car? A loft takes care of these questions and more. Studio 56 could be more than a new home; it could be the center of your world. 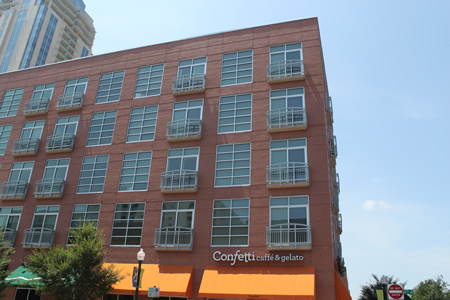 Send me more information about communities similar to Studio 56 Lofts at Town Center. Our agents gladly offer FREE property tours of Studio 56 Lofts at Town Center, Virginia Beach and homebuyer consultations to all serious buyers.